Panera Bread is coming to the South Bay Shopping Center! Great news for Boston residents! Panera Bread is coming to the South Bay shopping center in Boston! 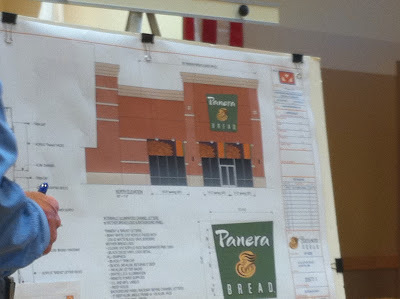 I was at a neighborhood meeting Tuesday night and representatives from Panera Bread unveiled renderings of their future space. The new restaurant will be roughly 4,400 square feet and is expected to open in November 2010. A representative from Edans & Avant, the company that owns South Bay, was also in attendance and announced that TJ Maxx will be opening in the old Circuit City space. They will occupy approximately 85% of the original Circuit City space, and Panera Bread will be in the remaining space. Renovations are currently under way for TJ Maxx. In addition, Old Navy is reducing the size of their store by 8,000 square feet and iParty will be opening in that space in the next couple months. iParty will temporarily open for Halloween season, but will close after for a full renovation, and should reopen later in the year. Add to that the approval of 2 huge developments projects in the Seaport District, Waterside Place and Seaport Square, and you can see there's a lot of development in the pipeline for South Boston! Last updated April 25 at 12:01 am.